ScanFS is a powerful disk search and cataloging program. 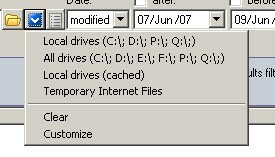 a search based on the contents of files. will report all mp3s that their filenames start with "artist1" followed by any other text and have the extension "mp3"
that their name contains the string "data"
The program can search in a list of directories, for example in order to allow searching in all drives. 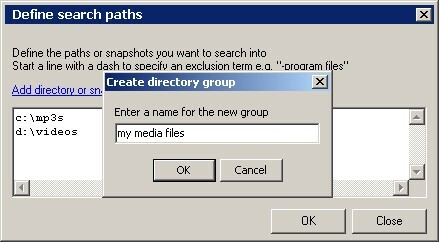 There are some preset directory groups that can help quickly selecting the group you want. and a list of groups will appear. and a window that will allow you to define your directories will be opened. 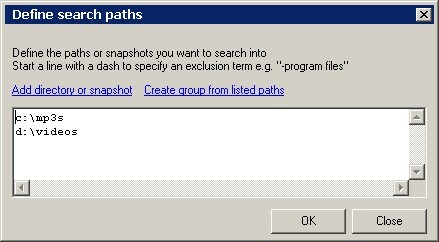 When you finish entering directory paths, click the "Create group" link-button to save it. To quickly enable any of these 4 selections you can type any of the [B] / [K] / [M] / [G] shortcuts in any of the "more than" or "less than" boxes. 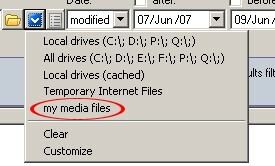 For example to search for files greater than 10 Mb click on the "size more than" box and type 4M. A value that equals to zero in any of the "size more than" or "size less than" indicates that the filter will not be applied. Simply typing 4M in the same box automatically enables the "search in megabytes" mode. 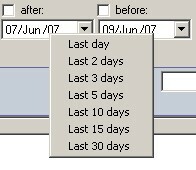 and can be selected by right clicking on any of the "date after" or "date before" boxes.